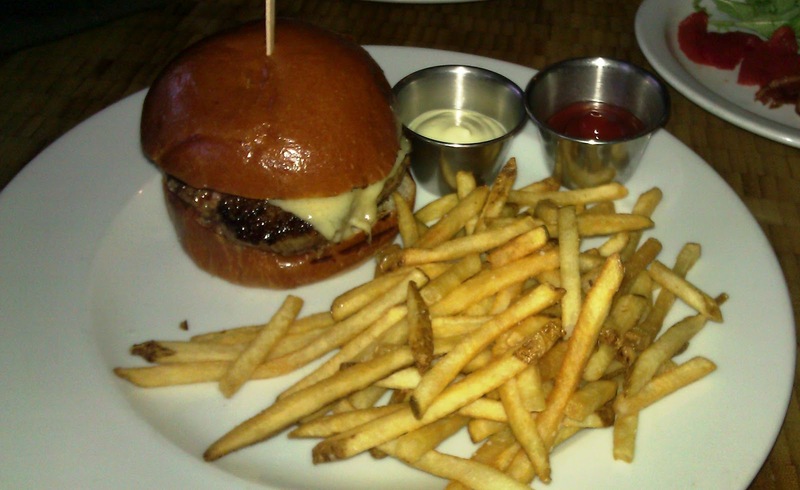 A few years ago, Fat Bruce Lee went to The Yard in Santa Monica, and he declared it to be an excellent burger.. This was back when Chris Jacobsen of Top Chef fame was running things. The Yard's website was next to useless. It was less than reassuring to note that the site promised that a new site was coming soon...in November of 2011. I do not think that "soon" meant what they thought it meant. Fast forward to to 2012, and I had a Groupon for The Yard. I bribed a guard and smuggled The Marinater out of the supermax prison where he was serving 12 consecutive life sentences for running moonshine in Utah and making illegal modifications to Frisbees. The great state of Utah and Wham-O, Inc. take that stuff more seriously than you might have imagined. The freshly tatted-up Marinater and I easily found $5 parking in one of the nearby public garages.We were seated promptly, and we ordered our $16 burgers. After a 25-minute wait, our cheeseburgers arrived. The Beef: The beef in the cheeseburgers at The Yard was a combination of house-ground Wagyu...Brisket and Eye Round (both wet-aged). Eye Round was an interesting choice for burger meat. Eye Round is a very lean and quite tough cut of beef. It is often used in cube steak. Eye Round is a cut, which requires braising or other tenderization techniques to make it less chewy. The combination of ground Eye Round and Brisket fell flat at The Yard. The texture was slick on the palate. The burgers were undercooked . to a barely warm Rare. However, cooking that Eye Round past that would have turned the bite into a mouthful of rubber bands. The fat from the Brisket simply coated the chewy bits of nearly raw Eye Round. This created a mouth feel akin to biting into oily, warm, firm, chopped, Jello that was seasoned with mild beef broth. Putting aside the alien texture, the flavor was mildly beefy, and there were so pleasant notes of iron and steak. There was also a faint note of funk The fat content seemed higher than it probably was, because the fat was not absorbed by the lean, dense Eye Round. The bite was oily. The choice of beef for this burger was interesting...in a bad way. 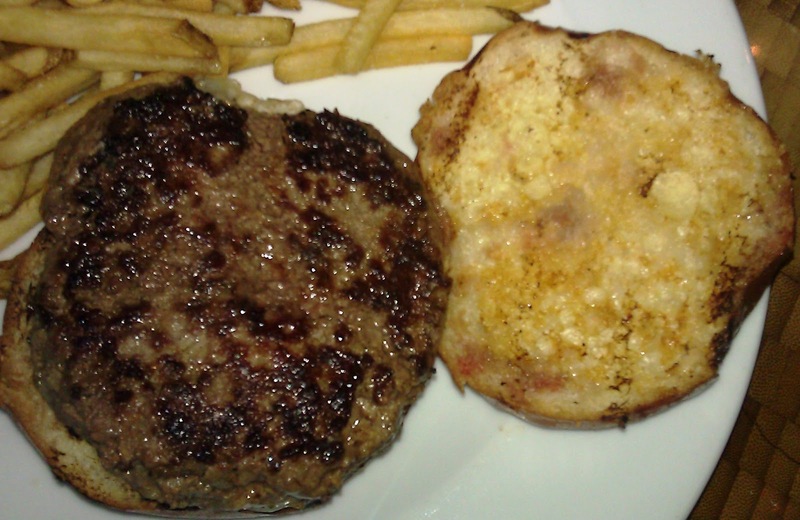 The Seasoning: There was a faint dusting of salt on the exterior of the burger patty. The Sear: The sear looked quite nice, but it was no match for the bait shop that comprised the interior of the burger. The Preparation: Meh. The beef came from Vernon Meats. This was according to our server, but I couldn't locate any such business during a cursory web search. Not that this mattered. This was not the sort of dish that I had any interest in seeking out twice. The burger patties at The Yard were about 6 ounces. I assumed that they were formed during the prep cycle. The pressure with which they were formed? The Yard could have used an industrial hydraulic press, and it wouldn't have mattered. The burgers would have come out the same as if they were gently formed by blind monks in a cave behind a waterfall. The Cheese: The Yard employed a stout Gruyere. The Gruyere added tartness, umami, salt, and some nuttiness to the dish. Sadly, Gruyere is not the best of melting cheeses, to this only added to the rubberiness of the bite. The Bun: The burger bun at The Yard came to us courtesy of Bread Bar. Bread Bar has always provided a fantastic product, and this was no exception. The Brioche was mildly sweet and perfectly tender and fresh. The bun was moderately toasted, but the beef was so wet and slick that the texture of the bun was lost in the bite. 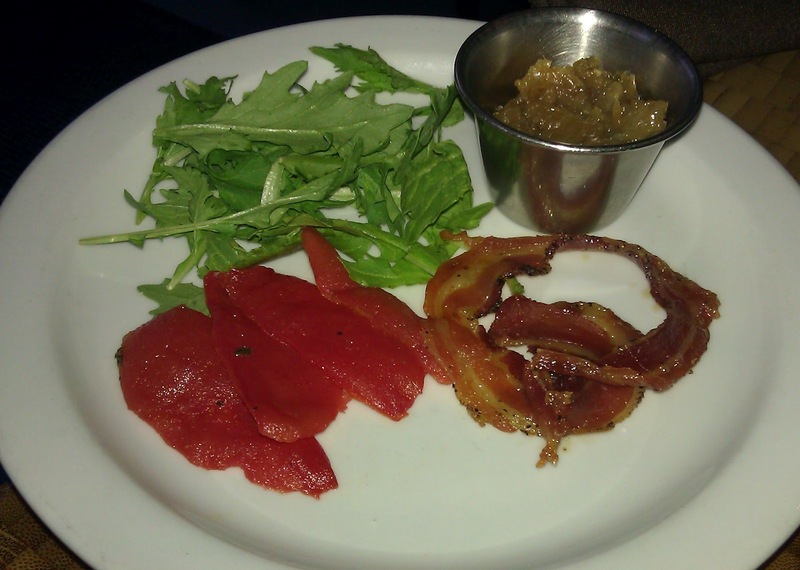 The Toppings: The burger was much improved when fully dressed with the accompanying arugula, crisp pancetta, and oven-roasted tomatoes. All of these elements lent firmness to the otherwise flaccid bite. The peppery, crisp pancetta was the star. The Fries: The peel-on, hand-cut, shoestring fries at The Yard were perfectly crisped in fresh canola oil. Further, the fries were perfectly seasoned. The fries were the clear winner on the plate. The Value: NO! 16 bucks for 6 ounces of chewiness was about 10 bucks too much. Without the Groupon, we would have paid $42 for 2 cheeseburgers and 2 soft drinks....OUCH. Fat Bruce Lee may or may not have been high when he first tried the burger at The Yard and pronounced it to be good. When The Marinater and I sampled the cheeseburger in 2012, it was an over-priced and ill-considered dish. Within 10 minutes of completing our meals, we both had stomach aches from these gut bombs. Burger Review : Leave this one to the tourists. This spendy burger will not have you running to The Yard.